1. For baklava: In small bowl, combine toasted pistachios, cinnamon and sugar and toss to mix evenly. 2. Coat bottom and sides of 9 x 13-inch (22 x 33 cm) baking dish with canola oil. 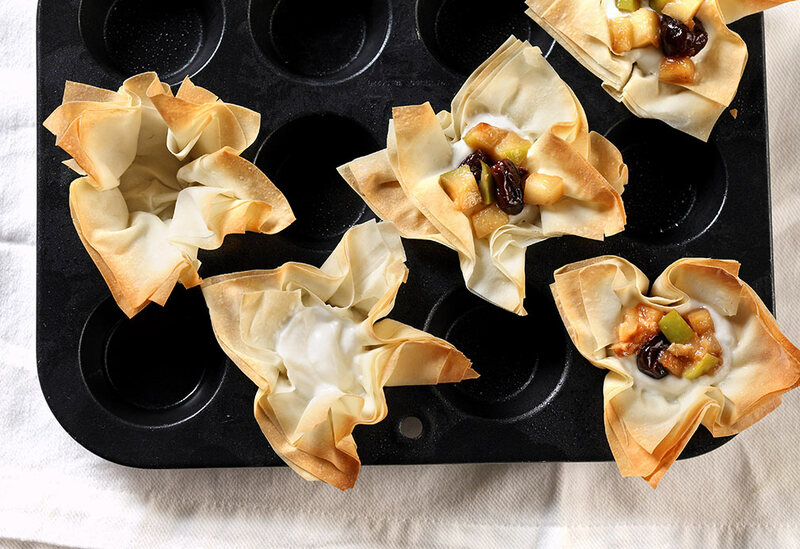 Cut phyllo sheets so they fit snugly in baking dish. Place two sheets of phyllo in dish and brush or spray with canola oil. Sprinkle with about 1/2 cup (125 mL) of pistachio mixture. Place another 2 sheets of phyllo over pistachio mixture, brush or spray with canola oil, then sprinkle or brush some milk evenly over top. Continue in this fashion, alternating between canola oil and milk-brushed sheets and pistachio mixture until all pistachio mixture is used, about 10 layers. Use 3 or 4 layers of phyllo for top layer. Brush top sheet with canola oil and refrigerate until firm, 15 to 30 minutes. 3. Preheat oven to 350 °F (180 °C). Cut dessert into 2-inch (5-cm) diamonds and stick whole clove into middle of each portion to hold phyllo together and add flavor. 4. Bake until golden brown, about 30 to 35 minutes. 5. For syrup: In sauce pan, combine sugar, water, honey, cinnamon and vanilla, bring to simmer and cook for up to 10 minutes to thicken or until it has consistency of maple syrup. 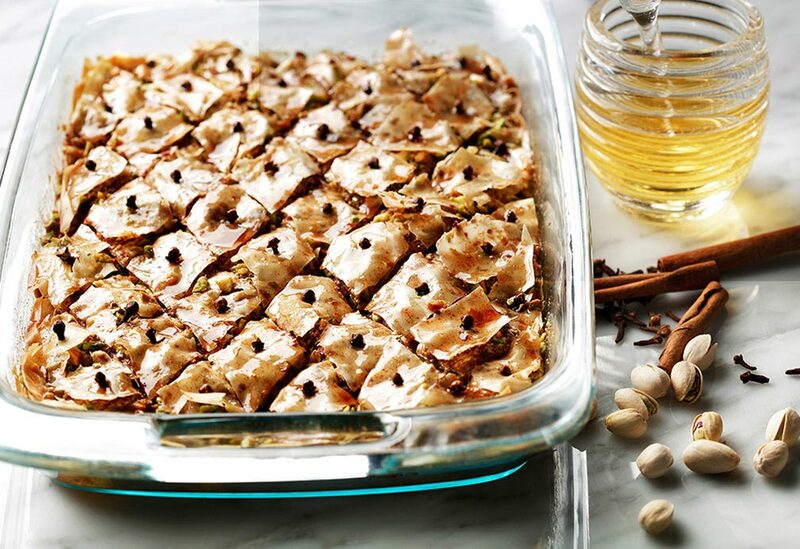 Pour syrup evenly over warm baklava, making sure syrup coats cooked phyllo. Cool thoroughly before serving. 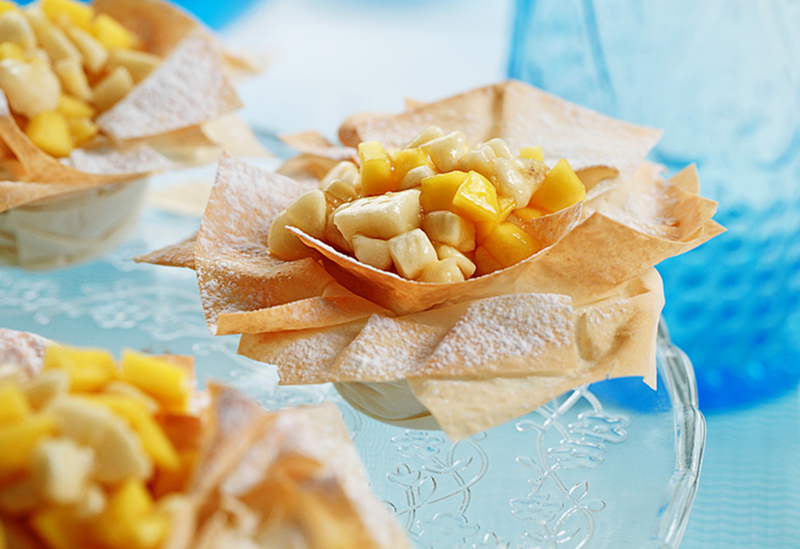 Cook’s note: Keep phyllo dough covered with a moist dish towel while using it to avoid drying it out. 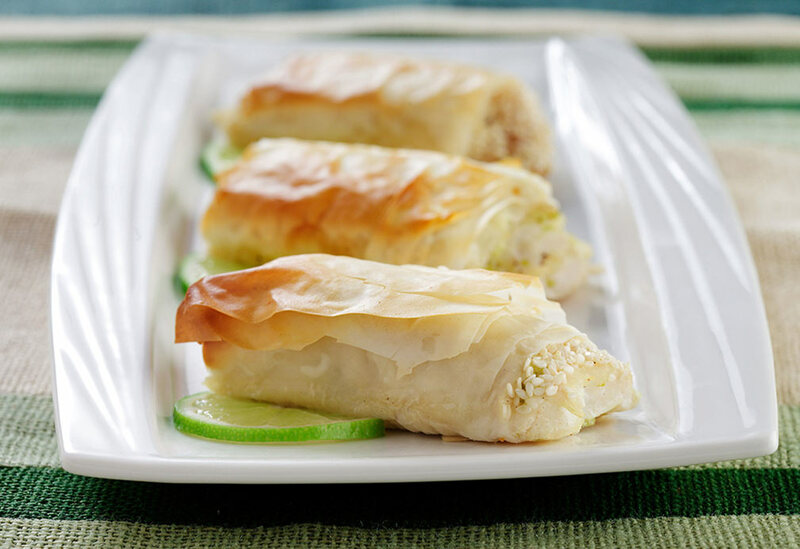 Phyllo and sesame seeds add a nice crunch to this entree!